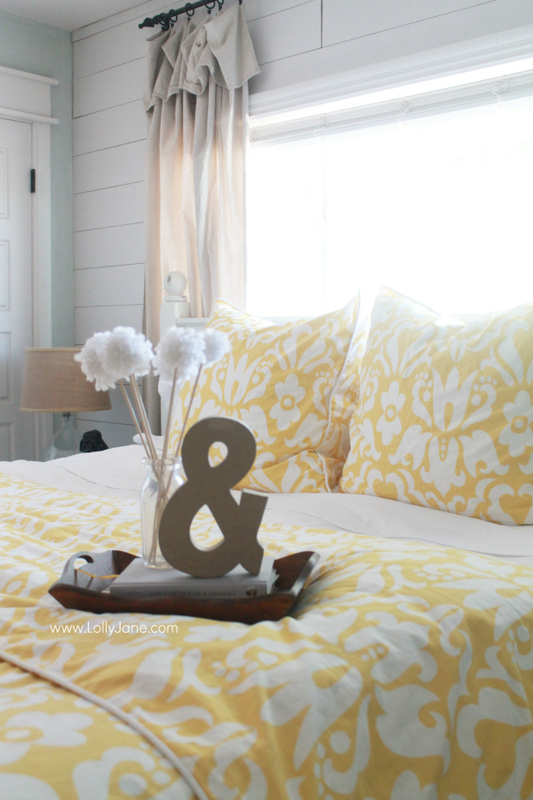 Do you switch out your linens seasonally? One of my close friends does this and I always thought she was bonkers, who can afford to swap every bed set out when the weather changes?? And she even has four seasons, here in AZ we only have two. And that second one isn’t much different than the first, lol! 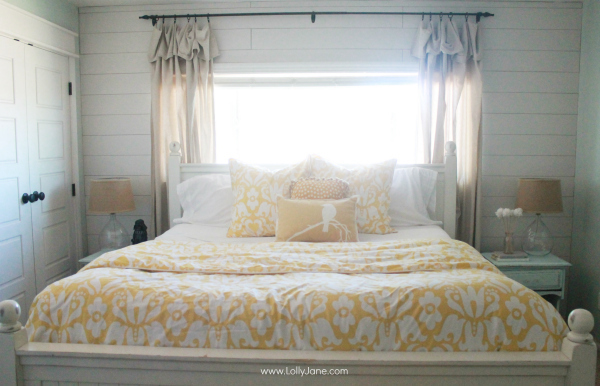 Well now that I’ve refreshed my bedroom for summer…I totally get it!! My room feels happy and matches the bright sun outside. I love it! 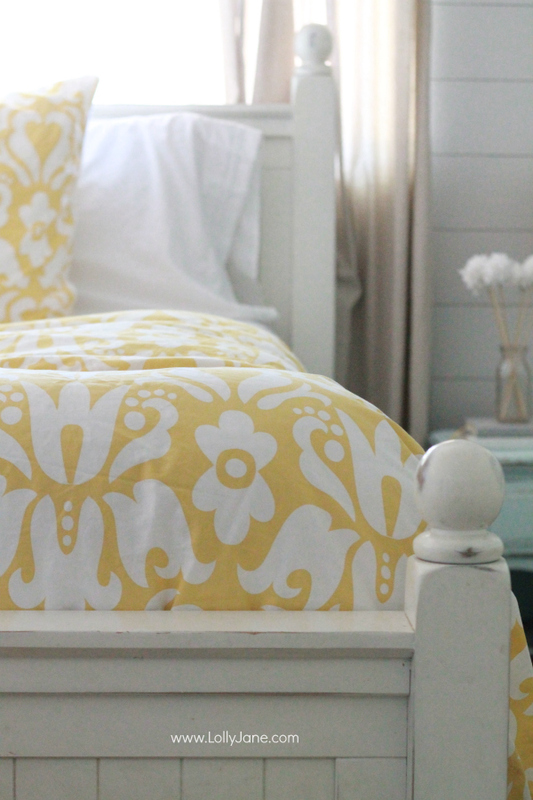 And all I did was swap some linens around…totally loving my master bedroom refresh, hello yellow! 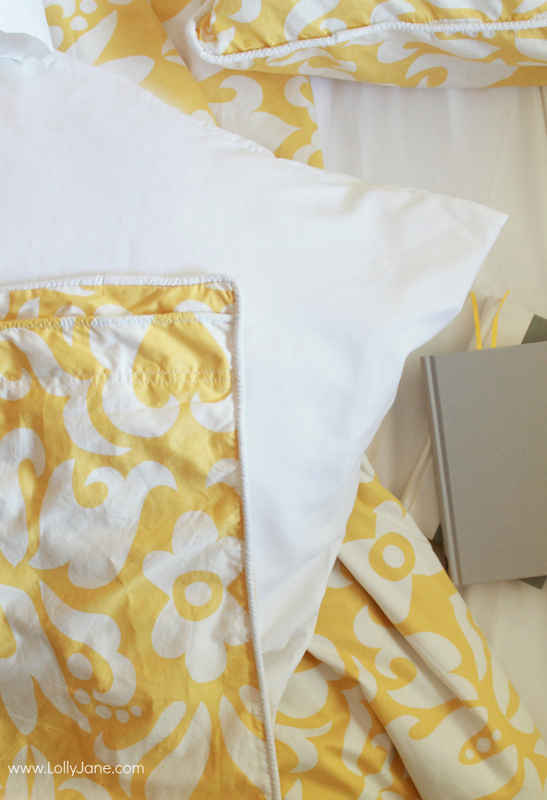 Crane & Canopy supplied this gorgeous duvet, Montgomery Yellow. I love it. I chose Euro shams in place of standards and couldn’t be happier. I feel like I’m in a hotel! I love the quality of C&C…seriously. 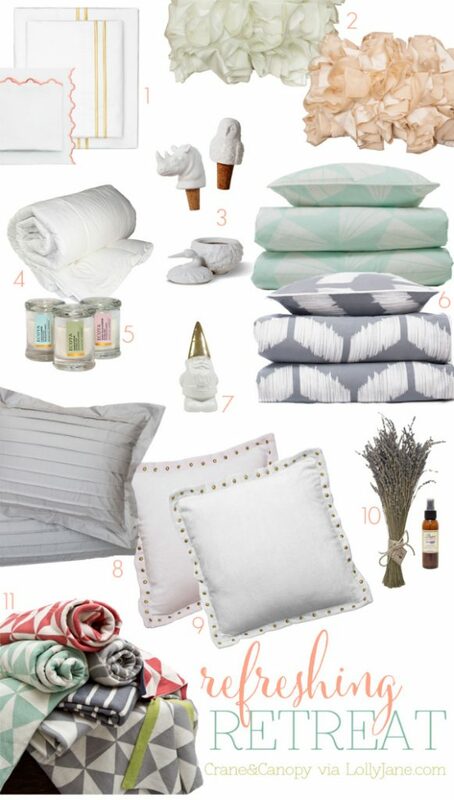 My last duvet was from a big chain and didn’t last more than a year, and it was a pricey set! Irritating. The piping makes all the difference, adore it. And the material is so soft and really well stitched. Kudos. One of the things I love about the duvet is the zipper closing. My last duvet had buttons that were constantly popping off in the wash. The zipper was a happy surprise and my hubby even said, “Did you take a pic of that?-be sure to include it” lol…yes, we love that little feature! Now if only I could get breakfast in bed once in awhile…. 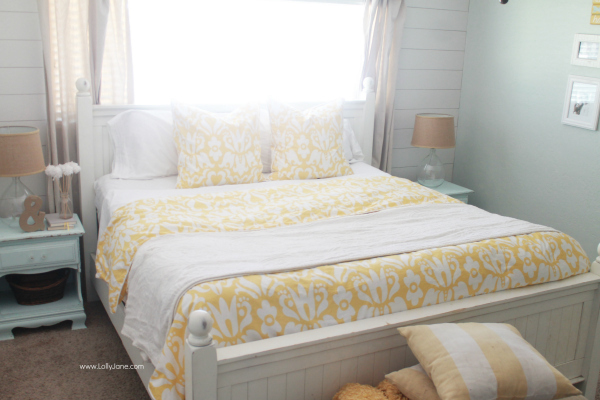 If you like this master bedroom, take a peek at my coastal master version too, what a difference linens make, right? Be sure to see how we decorated our main wall in our master, it’s all about US with our yearly couple gallery wall! 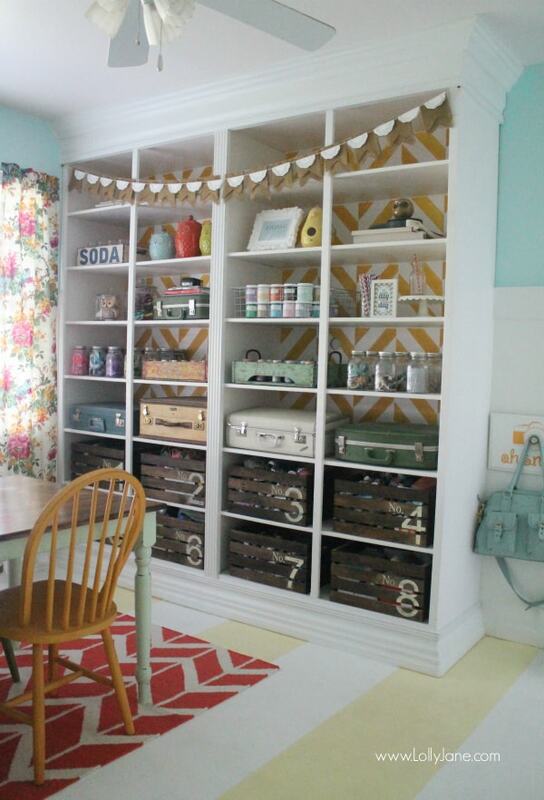 and our fun and eclectic craft room series. 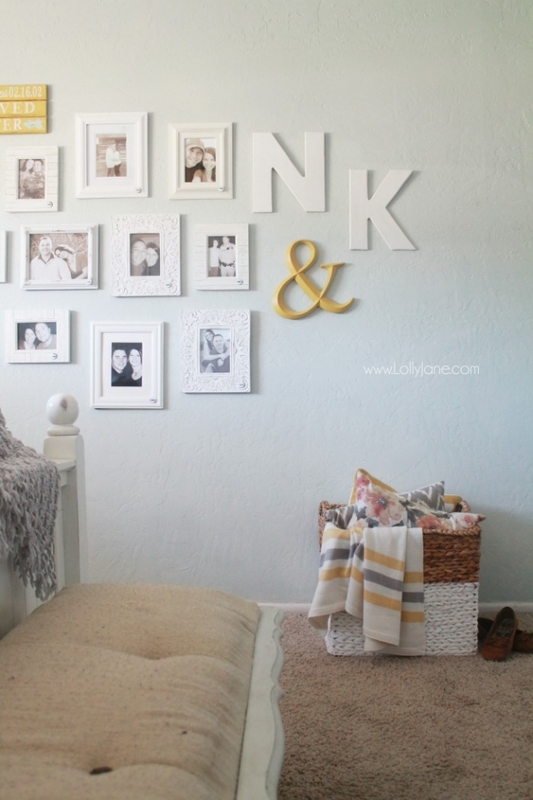 Your bedroom looks amazing! So light and airy and comfy. 🙂 I recently made over our master bedroom too, and bought my first ever duvet cover! 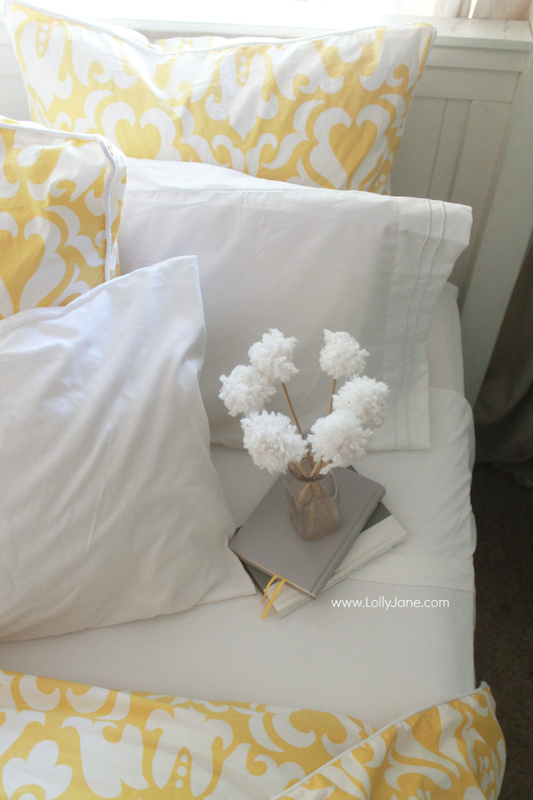 It will really make switching out our bedding so much easier when I’m ready for a refresh! This is my first time, and not my last! I love how fun swapping is. Why am I so late to the game!? Love it!! What is the color on the walls? Looks very versatile! So pretty! I have been contemplating a change for mine. I’m loving those burlap accents too! I really really really want to get a new blanket on my bed!! I just haven’t found THE one! Love this one you picked!! Check out some other on Crane and Canopy…Kristi ordered a gray set and she loves it! Hello yellow and hello happy!! What a lovely room. So cheerful and yet relaxing. You girls have such a knack for the perfect mix of both. I’m in the middle of updating my office + guest room and I hope I can pull it off even half as well as you guys have. Awww thanks so much, girl! Love your blog, you’ll rock it for sure! LOVE IT!! And hoorday for the zipper closure! Such a beautiful and refreshing room. They have such beautiful bedding ~ I love the set you chose ~ absolutely gorgeous! It looks great!! Hey, I especially love the curtains. I see that you mentioned they are drop cloths. Have you posted a tutorial about how you did them? Looks simple, but I would love to hear specifics. Thanks!! I love, love, love your duvet!! The color and pattern are beautiful!! I want it!! Yellow is a beautiful color. It has made your bedroom cheerful.. 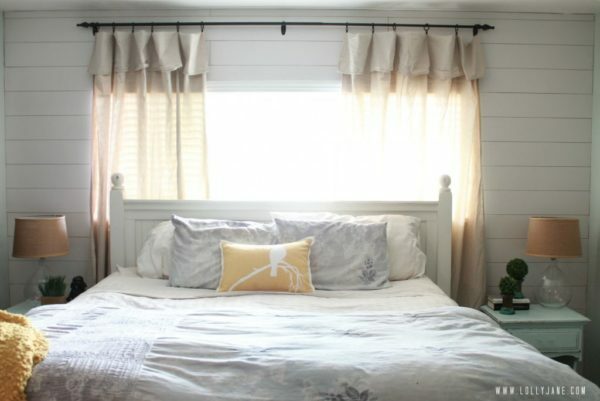 I love love love the bed frame and I am trying to find one like it.. Where did you find such a beautiful piece?? LOVE this!! I had a hard time choosing between this design and the Linden Coral. Isn’t it fabulous bedding?? 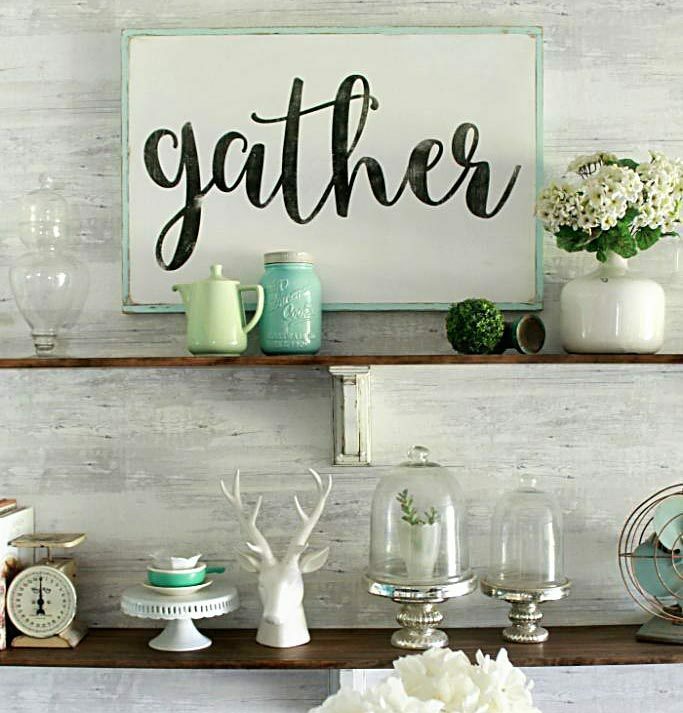 It looks so stunning against your planked wall. Such a beautiful room- I chose you as my hostess pick of the week at Work it Wednesday (tomorrow morning). Thanks for sharing it with us!! I love this! I love how gray and yellow go together. Plus yellow is such a happy color. Right now my bedroom is gray & yellow. 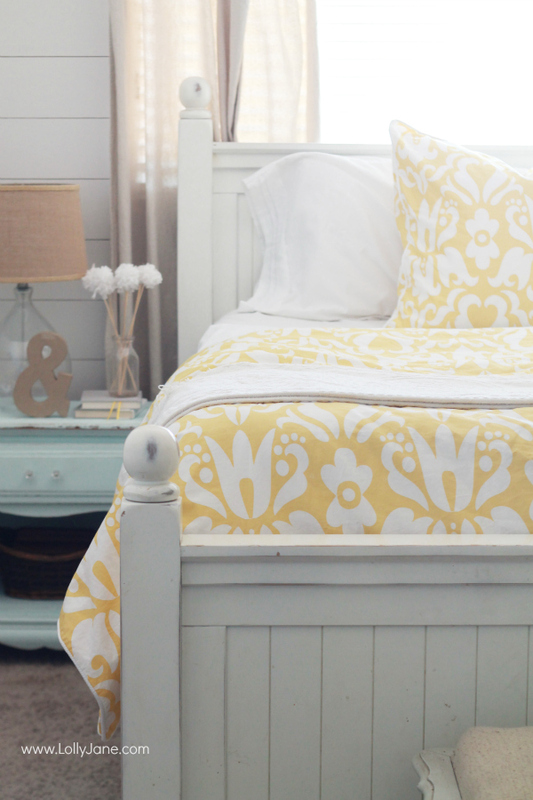 I love this bedding! I love the look and feel of this room! Where did you get the stripped throw pillows? I absolutely love your bedroom. I have one quick question and I pray it isn’t a silly question: What is the difference between a duvet comforter vs your regular comforter set? I am curious. This bedroom is so relaxing! 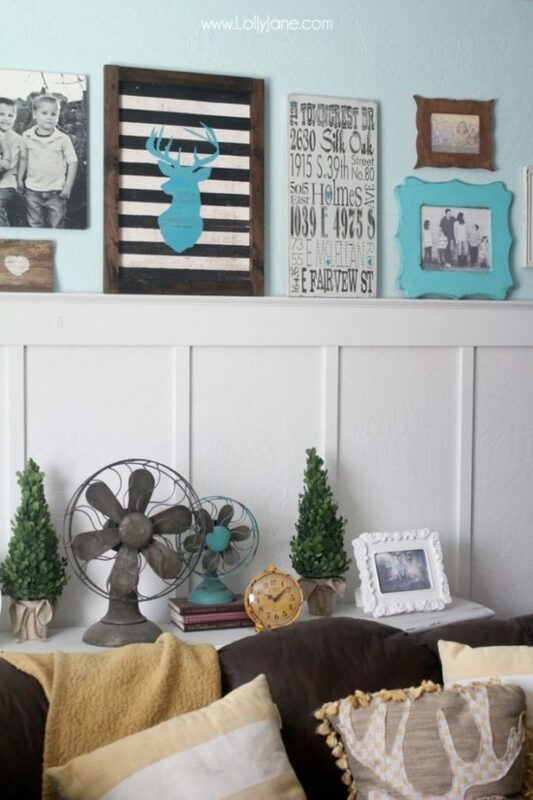 The colors are amazing along with the cute cottage -chic style! 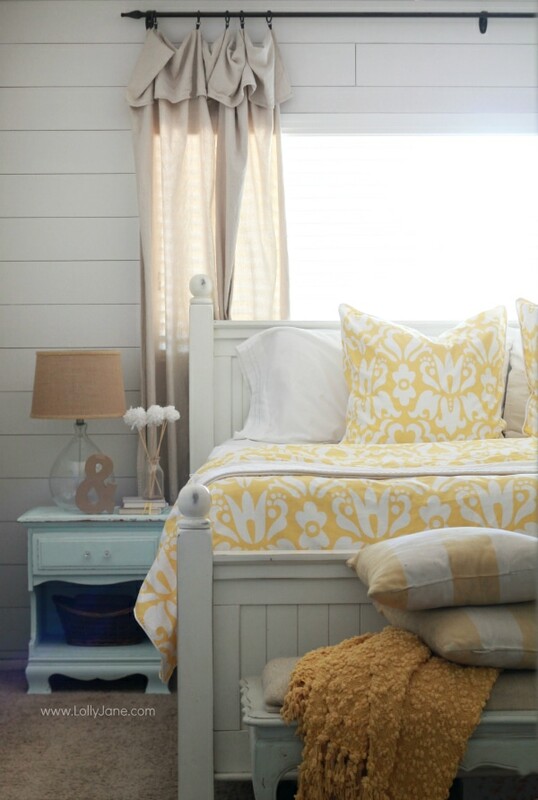 The distressed pieces paired with the cute bright yellow duvet is great!!! I looove the drop cloth curtains and I noticed you said you used curtain clips. How did you clip them to make it appear like there is a valance or other piece sewn on? Hi Lisa, we just folded them over. Smart, right?? NO SEWING is our best friend, lol! 2) I love the idea of no top sheet, no blankets, just the duvet. Has it held up to frequent laundering? YES!! Love it!! Still adore the zipper, the color hasn’t faded and is so soft. REALLY happy with this duvet!! You can grab these curtain clips from Amazon. Fold your drop cloth over about 12-18″ then clip all the way down, every 6-8″ apart. So easy! Does that make sense?